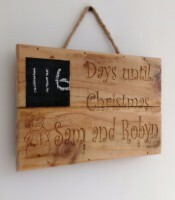 These personalised wall hangings are perfect for the Christmas countdown, encouraging writing and numeracy skills. Made from reclaimed pallet boards and timbers and hung on natural jute rope. These trees are versatile space savers for flats, apartments and other spaces restricting Christmas tree space. They can be hung externally on porches and house fronts as well as on front lawns and gardens. Available in natural wood or clear varnished as pictured. Trees can be made to be either wall hung or staked at base for use on garden lawns. Please state your preference when ordering. Free Local delivery within the Liverpool area. 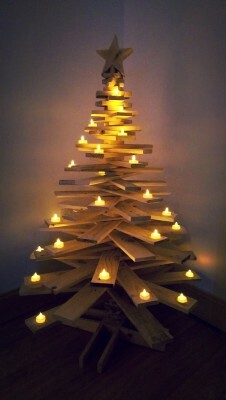 These beautiful Christmas trees are hand made from reclaimed heat treated pallet boards and reclaimed solid wood. 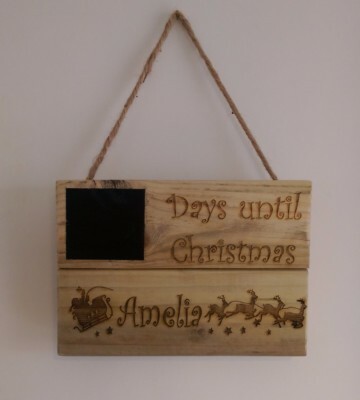 The pallet board branches have been finely sanded to a smooth finish whilst still bearing rustic markings in true pallet style. Boards are lanced through a reclaimed solid wood pole with finely cut dividers separating each layer giving ample space for decorative ornaments, crackers and of course... your very own Christmas Elf! 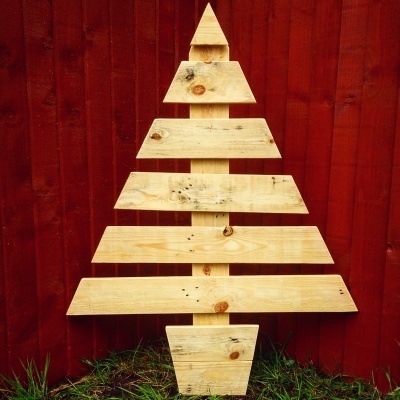 A solid wood double bolted base gives each tree a solid standing to take those tipsy family knocks on Christmas day. Finally for a beautiful finish each tree comes topped with a chunky hand made solid wood star. Each tree comes complete with 30 battery operated tealight candles. Free Local delivery within Liverpool area.